This is a really lovely plant which I wanted to introduce to you. It’s a relatively new plant to us so it felt right to make a short blog post, detailing it so you know a little more about it. Like all Microsoriums they come from the same family (Polypodiaceae) and all require fairly similar care – this is great news as it’s a straight forward plant to keep. Plant farms don’t need to do very much to grow this plant, and like us, we keep it emerged from water so that only the pot is 3/4 deep in a nutrient rich solution. Lighting is kept to a minimum and if you browse the web (or look at the clip below) you’ll notice that most of the ferns are kept in white tents which let some light through but not a lot. These plants, and many others too like a very humid environment and this helps to keep their leaves nice and green. 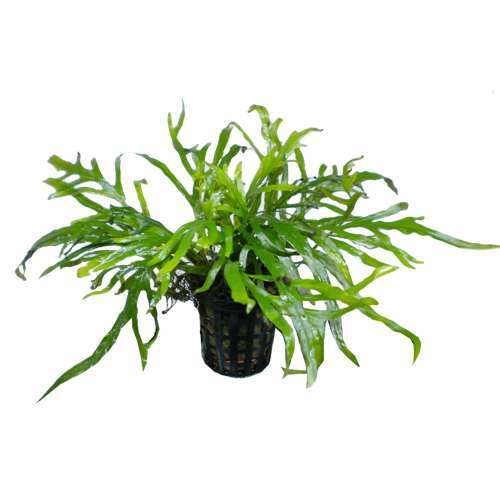 Microsorium Pteropus Trident is easy to reproduce – if you split the horizontal rhizome, you’ll create another plant. Incidentally because of the rhizome, this plant must only be tied to wood or rock – if you try and plant it in your substrate you’ll notice it rot quite quickly. The easiest way to tie it to wood or rock is by using Aqua Fine Line. Make sure when you tie it that it’s nice and tight so that it doesn’t float away. As this plant begins to grow you will find black spots under the leaves (you see this in garden ferns too). Don’t be alarmed though, your plant is not ill, what you are seeing are the reproductive organs called sporangia. There’s little else to say about this plant apart from that it comes with our full recommendation and once you have it in your tank, you’ll love it. For all our other potted plants, please visit our potted plant section and if you have any questions about this plant or maybe others, ask a question below. What temperature range does the Microsorum pteropus ‘Trident’ require? Is it suitable for a cold water tank? It’s a pretty tough fern and can survive in cooler waters. What temp is your tank? It’s now 18°C. I wasn’t going to heat it at all but the kitchen is colder than I expected so I’ve invested in a heater.